Industry Events used to be boring. You’d dress up to sit at a table, eat a two-toned catered meal, drink sweet white wine, and listen to an aspirational speech drone on before driving home, hoping you could think of a reason not to attend next year. They’d call it a gala, or worse, a “night under the stars!” But it never quite felt that way. The advent of Food Network and the like started to change the game. We got confident. We could entertain on our own…. and make it fun! Then we got creative. Ambitious spreads of beautiful, and even sometimes delicious, food was the thing. We became discerning. Where is this lamb from? How was it raised? Is it local? And we started posting. Now everyone gets to see the impossibly perfectly nuanced herb crust on our artisanal black truffle & burrata pizza. Then came the millennials. A generation so over it, so bored with the status quo, arms crossed, can’t be bothered… And while their elder generations wondered when this group of upstarts would finally join the labor pool, those same kids reinvented the wheel, with results nothing short of seismic. Enter the Experiential Marketing firms, (many now lead by millennials) reimagined the game, taking huge steps away from the self-congratulating galas. Instead, now creating immersive experiences that envelope guests completely in whatever world corporate America is promoting. It is no surprise why highly skilled hospitality minded Catering & Events companies have found symbiosis in this new paradigm. Experiences are mandatory in 2018. That means, of course, that catering has to raise the bar too. We have to do something more than just provide a meal to keep you in your seat. The media is showing up, everyone is posting, the stakes are higher than ever. 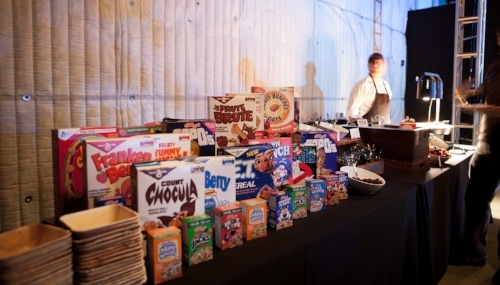 We now see our food & beverage integrating into the DNA of these events. Discerning, focused clients understand the value of 360-degree event curation. The food must not only look and taste amazing – but follow a narrative that enhances the experience. The entire process has become a full collaboration with venues, event planners, production houses, PR firms, and entertainment industry clients to create these new experiential events that are changing the way everyone wants to celebrate. We see many of our partners, like Goya Studios, a raw event venue in Hollywood, CA transform into everything from an 80’s post-apocalyptic trailer park, to a pre-historic Cave meets Burke Williams for men. We are no longer putting out chafing dishes of well-prepared proteins/veggies/starch. The food and beverage programs are being themed down to a granular level – and the results are stunning. Track Marketing came to Los Angeles for a screening of Black Panther looking for interesting items that were just a step beyond movie theater concessions. House-made fruit roll-ups in mango-jalapeño and blueberry-ginger flavors, hot pretzels with Nutella, and s’mores bites fit the bill by being approachable while still raising the bar beyond the usual popcorn and junior mint offering. The Academy of Motion Picture Arts and Sciences decided they wanted to step outside the box from their traditional set up for a pre-Oscar event. The “Welcome to LA Station” showed nominees from around the world the fun of our street food with duck confit sopes and K-Town sliders, to name a few. An Avocado Bar was a perfect complement and offered something that could satisfy every major dietary restriction in one stop. The trendsetters in our industry all have one very important thing in common. They want to make sure their guests feel like they’re having a completely unique experience, and through food, creating a one-on-one experience with resonance. Now, the ripples are felt in social and corporate events. More and more we see weddings, private gatherings, employee appreciation events, all asking for something new and different. And it’s the highly skilled Catering & Events companies, including The Copper Key Catering & Events, bringing it full circle and delivering this next phase to the masses.